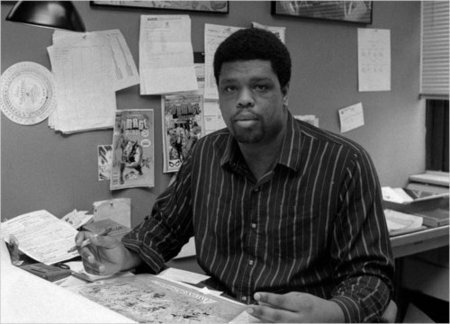 Dwayne McDuffie, writer and publisher of comics and graphic novels representing persons of color, died after complications from heart surgery. McDuffie's work for Marvel’s new Deathlok series (1990-1992) is incredible, articulating a vision of race-inflected networked consciousness and media shift. McDuffie and I had a brief exchange after he encountered my early academic work, and I sincerely wish that exchange had been longer. McDuffie’s work is inspiring and amazing, and we are much poorer for his passing. This page contains a single entry from the blog posted on February 26, 2011 9:07 AM. The previous post in this blog was Bikes of San Francisco. The next post in this blog is Rainbow Lab.